A vice president of a hospital was slashed by an unidentified man near the hospital in Pinggu district, Beijing Thursday morning, local media reported. 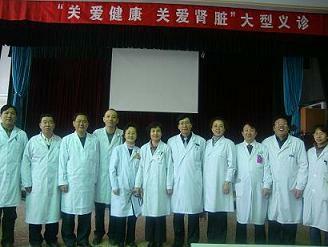 At around 6am, Wang Jianyun, vice president and chief physician of the Pinggu District Hospital, was attacked on his way to the hospital. While investigation is still ongoing, police suspect two men attacked Wang before escaping by car. A witness said a group of old men playing the shuttlecock found Wang bleeding and rushed him to the hospital for emergency treatment. Police cordoned off the area and obtained footages from surveillance cameras overlooking the road. It is still uncertain if the video images are clear because it was still dark outside when the doctor was stabbed. Hospital staff refused to comment on Wang's condition, citing employee confidentiality, but reports indicated that Wang suffered multiple wounds in his lungs. He is now in the intensive care unit after a surgery.